I did first use my DB50XG (wich is an waveblaster daughterboard version of MU10) wich had thes ame DAC as SC-88 (D63200) to trace the needed pins, but later when i opened the MU10 case so did it not use the same DAC as DB50XG but the actual soundchip was same (XQ036A0) so i know wich pins that are needed. 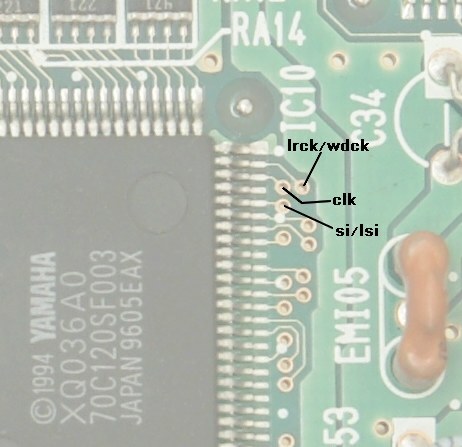 I guess the only thing that is needed to change from the schematics from the japanese pages i posted is to connect ground to pins 24 and 25 of the Toshiba chip as that means 44.1 khz (i measured the LRCK pin of "XQ036A0" to 44.1017) and the SC-88 is outputting 32khz (5v to pins 24 and 25). In response to your PM: I dare say the DIT4096 could be used, but as I mention in my PSX S/PDIF mod thread it took a bit of deciphering with the help of the Gamecube S/PDIF info. Now looking at the pages for your mod it seems that there might not be a easy way. One thing that the GC and PXS mods (and all the other digital audio mods on the Wiki) have in common is that they all have a MCLK signal (on the TC9231N it's referred to as 'XI' on the CG mod, which generates this using a separate crystal). The mod you mention dose not have a dedicated MCLK signal and it seems it is generated using the extra logic and possibly even a special function of the TC9231N, but as I havn't seen a datasheet for that I can't be certain. 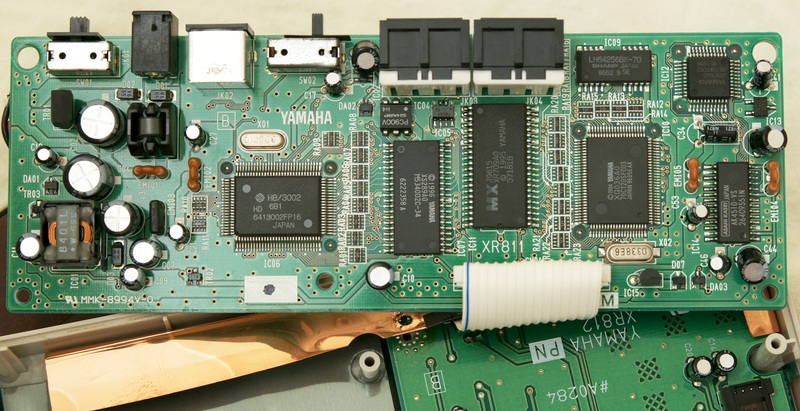 and also as i just found the datasheet for the DAC/ADC (ak4510) used on MU10 i traced the wich pin on the Yamaha chip that was MCLK, so i can now connect the MCLK to the mod if needed. The DAC on the DB50XG did not have any MCLK input. butter_pat_head... exactly how did you connect the pins not used on the DIT4096 used in the playstation mod? Is "reset" pin really a must for the DIT4096 to work, as i dont know if the MU10 chip output a reset signal? As for the reset line, I connected it because I could. I saw that the DAC in the PSX has a reset input so I just connected the DIT's reset pin to that. If you cant find a suitable reset source then it should be possible to build a simple rc reset circuit. I don't know if the DIT absolutely needs the reset but the datasheet recommends that you have it present. I will post some more details how it is connected later. Great! Nice to see (or rather hear) that you got it working. As for the clipping issue, I might be taking a wild stab in the dark with this but you may have an issue with the pre-emphasis. The DIT's emphasis control (pin 23) is active low while on the TC9231N (pin 26) it is active high. The mods you linked to earlier have this pin tied to ground so with the DIT it should be tied to VCC. Other than that I don't think theres much you can do electronically. Maybe you could lower the playback volume in your midi software? BTW, thats some nice music there. It would be interesting how they would sound on my SBLive with it's 230+Megabyte soundfont. Pin 23 of the DIT is connected to VCC... but i tried to connect it to ground also just to test but there was no difference. Actually this was the main reason i wanted to spdif mod my MU10... i wanted to get rid of the clipping sounds as i thought it could not happen if the signal was digital. Are the two MP3 recordings meant to have examples of the clipping? Because when I listened to them they sounded OK to me through my AV receiver and Hi-Fi speakers. I admit defeat on this one! No they are not clipping, i'll see if i can record an example... it is not really any difference from the analog sound output and digital when it comes to the clipping on loud songs. I can of course lower the volume using the midiplayer program but on some songs it affects the instrument volume more than the DSP effects so it can sound unbalanced (bad). 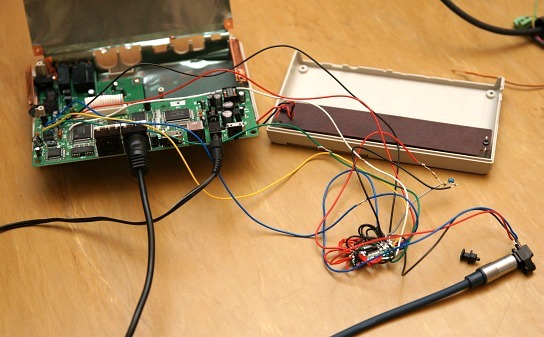 A thing i might point out is that when i connected the wires to the dit4096 so did i solder directly on the DAC pins and not thfrom the holes i marked in the pic in the first post (with exception of masterclock). 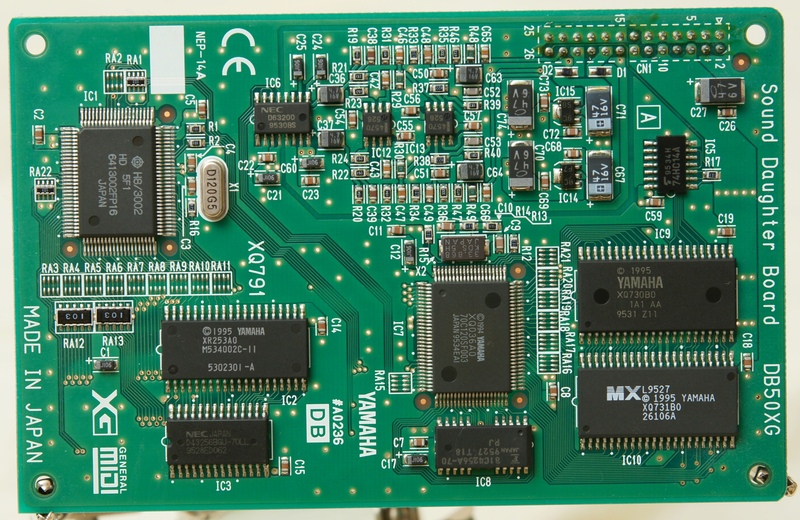 the clock pins goes directly to the DAC but the data goes to the chip that is to the top right corner seen in the bigger MU10 pic i posted (marked XR976A0). I did get a better sound when get the data after it passes thru the XR976 chip as you can hear, this would mean i can't modify the DB50XG as it does not have an XR976 chip. I am speculating if this has something to do with the fact that the DB50XG has 18bit DAC(nec D63200) while the MU10 has a 16bit DAC(AK4510)... i mean the data needs to be converted from 18bit to 16bit on MU10 before it goes to the DAC? Sounds ban on that sample there. Im taking a wild guess that the DIT is dropping the 2 most significant bits from the audio stream and is also why it sounds louder. 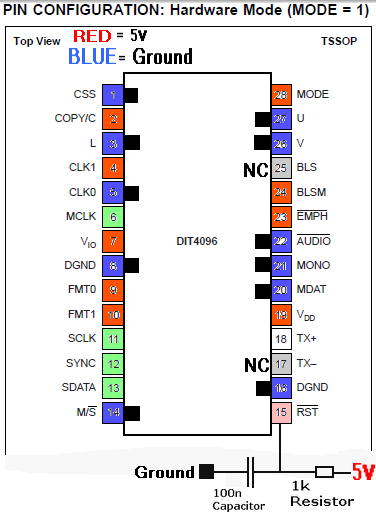 I just checked up on the DIT4069's datasheet and it does support 18bps but ony in the dreaded software control mode. At a minimum thats an extra uIC like a Atmel AVR with a program to setup the DIT over a I2C connection. Not that it matters anyway because AFAIK most consumer grade equipment will only accept 16 or 24bps (I could be wildly wrong on this). Converting 18 to 16 bit isn't that hard to do in theory, just drop the 2 least significant bits. Super easy to do in software but to do it in hardware real time would require something like a CPLD and the know-how to program it. Well, i guess it might be worth to try the mod using the Toshiba chip as it seems to support 32-bit. Although i have no idea what my soundcard spdif input supports... maybe only 16-bit? It's a Terratec DMX6fire USB. Here is a pic of how i setup the DIT4096, i hope it does not look too messy, i tried to make it as easy to understand as i could so as many as possible would understand it. This is a "general" setup that would work on several systems... not only the MU10, i think it would work on Playstation also.